McCain will hold a rally in Tennessee later Monday. (CNN) - John McCain raised questions about Barack Obama's background and questioned the Illinois senator's truthfulness at a rally in New Mexico Monday, one day before the two White House hopefuls square off at the second presidential debate. The comments, which came hours after Republican VP candidate Sarah Palin publicly questioned Obama's patriotism while raising questions about his connections to onetime radical William Ayers, are among McCain's harshest language to date on the campaigning trail and signal the campaign is ratcheting its attacks on the Illinois senator with less than 30 days remaining until Election Day. "I don’t need lessons about telling the truth to American people," McCain will say according to prepared text sent out by his campaign. "And were I ever to need any improvement in that regard, I probably wouldn’t seek advice from a Chicago politician." 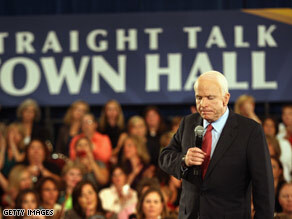 McCain delivered the remarks at a rally in Albuquerque, New Mexico, the hardly-fought battleground state where the latest CNN poll of polls shows the Arizona senator trailing slightly. "My opponent’s touchiness every time he is questioned about his record should make us only more concerned," McCain also said. "For a guy who’s already authored two memoirs, he’s not exactly an open book. It’s as if somehow the usual rules don’t apply, and where other candidates have to explain themselves and their records, Senator Obama seems to think he is above all that." The new language is part of the McCain campaign's effort to move away from the country's economic crisis as the primary narrative on the campaign trail, aides told CNN's Dana Bash earlier Monday. McCain, the aides say, will try to reframe the economic issue into an overall theme that Obama is still a virtual unknown, and is not the right person to steer the country through its current financial turmoil. "All people want to know is: What has this man ever actually accomplished in government? What does he plan for America? In short: Who is the real Barack Obama?" McCain said. The Obama campaign quickly responded to the comments, calling McCain the "one truly angry candidate in this race. “On a day when the markets are plunging and the credit crisis is putting millions of jobs at risk, the one truly angry candidate in this race kept up his strategy of ‘turning the page’ on the economy by unleashing another frustrated tirade against Barack Obama," Spokesman Tommy Vietor said. My opponent has invited serious questioning by announcing a few weeks ago that he would quote - “take off the gloves.” Since then, whenever I have questioned his policies or his record, he has called me a liar. To hear him talk now, you’d think he’d always opposed the dangerous practices at these institutions. But there is absolutely nothing in his record to suggest he did. He was surely familiar with the people who were creating this problem. The executives of Fannie Mae and Freddie Mac have advised him, and he has taken their money for his campaign. He has received more money from Fannie Mae and Freddie Mac than any other senator in history, with the exception of the chairman of the committee overseeing them. Did he ever talk to the executives at Fannie and Freddie about these reckless loans? Did he ever discuss with them the stronger oversight I proposed? If Senator Obama is such a champion of financial regulation, why didn’t he support these regulations that could have prevented this crisis in the first place? He won’t tell you, but you deserve an answer. McCain why oh why are the little old man is gone. Oh why oh why do he do the things he do. John/Sarah what are you doing. You are killing me. You can't even run a good campaign and your good ole boy system is letting you down except Joey so tell me what are you going to do. Attack attack atttack and guest what John/Sarah no one is listening because we are on the economy. Backsliding Sarah has already done the damage. Practice what you preach old man practice what you preach. No Negatism in this campaign but guess what again old man you don't know how. Does American need a President who would MUD his way into the Oval Office...McCain is it by "any means necessary?" This man should have retired years ago...this is sad and pathetic that he has to resort to these gutter type of tatics to try to obtain the highest political seat in the land...McCain, remember when you sling MUD some of it will splash back on you. The market is down 700 points. Perhaps you could talk about how you plan on repairing the damage Republicans have caused instead of trying to change the subject. Senator Obama is a patriot and devoted public servant. Stop your shameful attacks. Ok here we go...we knew this was going to get personal. McCain's last chance is to attack Obama personally. Pure desperation. Does McCain not have any policies in place for these issues? These attacks will not work. McCain.. please stop the lying and stick to the issues. Americans deserve better. Mr MacCain, shame on you. American families are faxing one of the worse economic time they can remember from 1929 and you are talking ... about obama ??? This is so desrespectfull MrMacain. WHAT DO YOU HAVE TO SAY ABOUT AMERICA REAL PROBLEMS LIKE ECONOMIE ??? AMERICA DOESN'T NEED NEITHER WANT A PRESIDENT THAT WILL TALK ABOUT X-FILES, X-MEN, OR JAMES BOND PAST WHILE AMERICA IS WORRIED ABOUT IF THWY WILL HAVE FOOD FOR KIDS (BECAUSE MACCAIN AND CINDY DON'T HAVE THOSE KIND OF ECONOMIC PROBLEMS WE HAVE)!!! The more McCain's campaign try to swiftboat Obama, the more his poll numbers will go up. It did not work with Hilary and it will not work now. The American people are smarter than this. If he was so concerned about the American people, why did he not bring these issues up before? Why wait until you are on your last political leg to start with the sleaze? I have lost all respect for John McCain and I hope he gets voted out when he goes back to the Senate. His political career is over.